Kane Douglas is available for immediate Wallabies selection after signing a three-year contract with the Australian Rugby Union and Queensland Reds to play Super Rugby until the end of the 2018 season. Douglas, who boasts 14 Wallabies caps, returns home to Australia after a brief stint in the European Pro 12 competition with Leinster, having played 20 matches. He previously played 75 Super Rugby matches for New South Wales and was a key contributor for the Waratahs in their 2014 championship-winning campaign. "I'm very grateful to the ARU and QRU for giving me the opportunity to return home to Australia to continue my rugby career in Queensland," Douglas said. "It's a really exciting time here for the game, and I'm looking forward to being a part of it over the next few years. "It's great to see the Wallabies build some depth across the park over the past 12 months, especially at lock, and I'll be working hard to fight my way back into contention." Wallabies coach Michael Cheika said: "It's great to see Kane back playing his rugby in Australia for the long term." "His return will bolster our tight-five stocks, and that is a strong objective of ours over the next 18 months" Kane will join a very competitive race to the wear the No.5 and five jerseys within the Wallabies, with [Rob] Simmons, [Will] Skelton, [James] Horwill, [Rory] Arnold, [Sam] Carter and [Dean] Mumm all in the mix." "We will see how Kane is progressing physically over the next week before considering him for any game time." 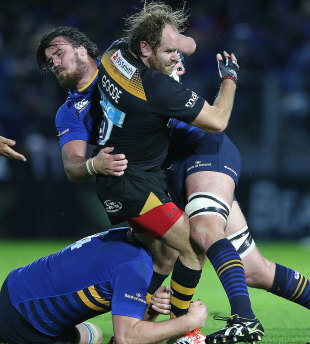 Greg Growden reported in Ruck'n Maul on Friday that Douglas could return home to Australia only after the payment to the Irish Rugby Football Union of a release fee "of around $Aus250-300,000".